Archaeological investigations of a site at Kingsmill Resort—best known for colonial-era sites related to Kingsmill Plantation—have shed light on the property’s fascinating 19th-century history. Archaeological Site 44JC1140 (in the state inventory of sites) was discovered and evaluated by archaeologists from Cultural Resources Incorporated (CRI) from 2005 to 2007. A large number of artifacts typical of a dwelling site indicated intensive use of the site during the early to mid-nineteenth century. The CRI investigations identified distinct clusters of artifacts, remnants of brick box drains, and traces of postholes. Documents and maps from the 1800s suggested that one of the Kingsmill Plantation slave quarters stood on the site from about 1800 to the 1840s. Intensive data recovery excavations by William and Mary Center for Archaeological Research (under contract to Environmental Resources Management [ERM]) began in 2014. The first stages of that work hinted at an intriguing possibility—that Union soldiers who occupied the area beginning in May 1862 with the Civil War’s Peninsula Campaign had adapted the former slave quarter for their own use. Photos: Site 44JC1140 was in a patch of woods (right) on one of the Kingsmill Resort golf courses. The marginal soils sloped down to a small stream that flows into the James River (below). Unsuitable for agriculture, the site was a convenient location to house the plantation’s enslaved workers in small cabins, which Civil War soldiers later adapted for their own use. The quarter stood a few paces from the plantation drive and only a few hundred yards from the 18th/19th-century Kingsmill mansion. 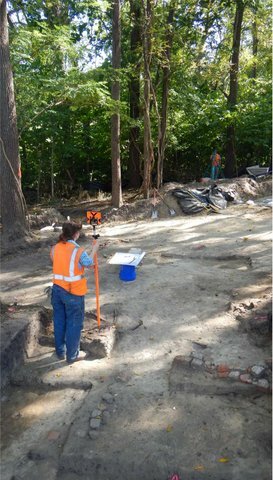 The William and Mary Center for Archaeological Research conducted this research under contract to ERM. Both AT&T and Verizon sponsored the project in order to mitigate proposed adverse effects on the archaeological resources under the Section 106 review process of the National Historic Preservation Act (NHPA) of 1966. The project was developed in cooperation with the Federal Communications Commission as the lead Federal agency and with the Virginia Department of Historic Resources as the State Historic Preservation Office.